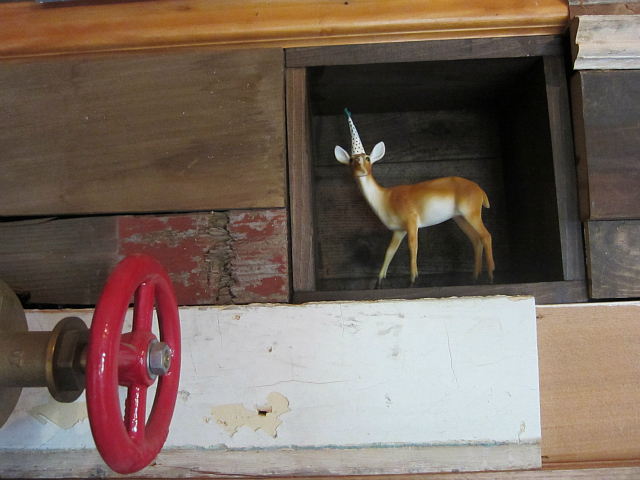 Why Weren't You in Wassaic This Weekend? 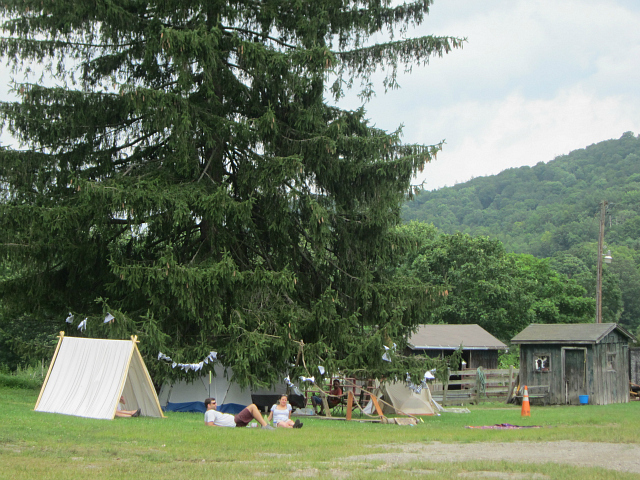 Why Weren’t You in Wassaic This Weekend? 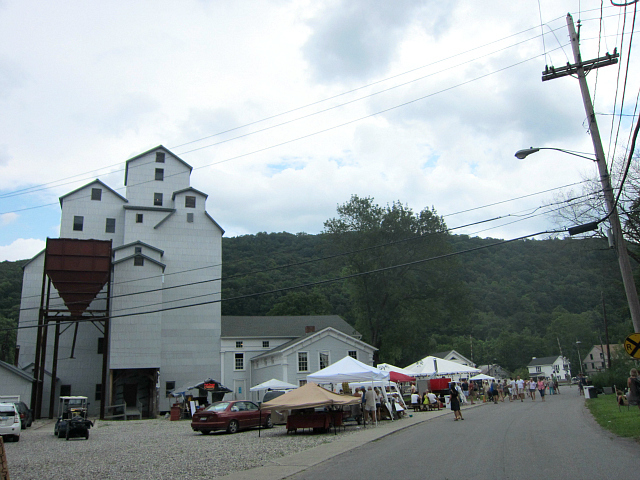 It was in 2008 that the first Wassaic Project Summer Festival was staged in the old mill by the railroad tracks in the hamlet of Wassaic, New York. 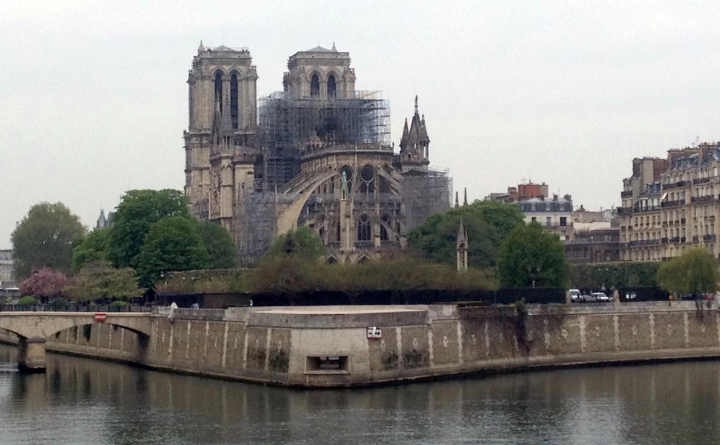 Since that debut, each year has attracted more and more visitors for the three-day event, as well as increased engagement with the local community that has seen this once condemned but historic structure transform into a contemporary arts magnet. The Wassaic Project has over its history expanded its programming, hosting open studios for its artists-in-residence throughout the year, as well as music and film events, but its annual summer festival remains the biggest draw. Wassaic, like many small towns across the country, suffered the economic loss of local industry, and the Wassaic Project strives to reignite its energy through art. Eve Biddle, Bowie Zunino and Jeff Barnett-Wisby who co-direct the Wassaic Project are all active and working in the area, and in addition to keeping the festival free, the Wassaic Project connects with the community by offering affordable artist-led workshops for adults and children, and they recently partnered with the local fire department for a fundraiser. The 2012 Wassaic Project Summer Festival was held this past weekend, and I took the Metro-North up on a sporadically stormy Sunday to see the art shown in and around the mill. 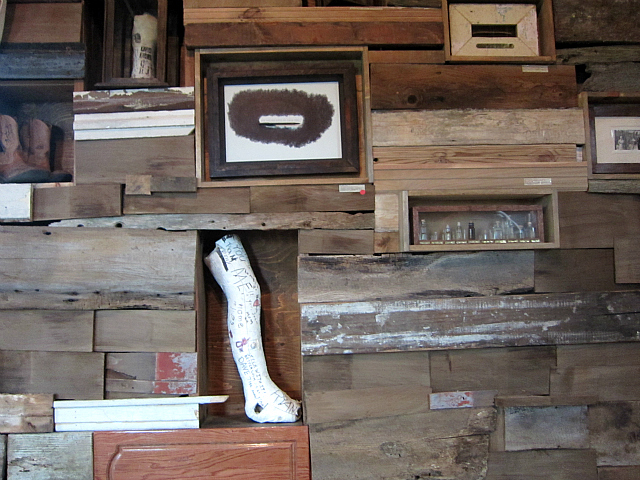 I visited the Wassaic Project last year for the first time, but had never attended the festival. By attending on Sunday I had sort of missed the party, with many artists and visitors camping on Friday and Saturday night on the lawn by the 1940s Luther barn that hosts artist studios. The previous two nights had been bustling with music, film and artist talks, and even a screening of “Sleepwalk with Me” that was followed by a Q&A with its director, writer and star Mike Birbiglia. However, many had stayed around for a chill Sunday afternoon, and when we arrived there was scratchy, droning music played by Long Distance Poison, plenty of wood-fired pizza topped with kale and honey, and very affordable beer. 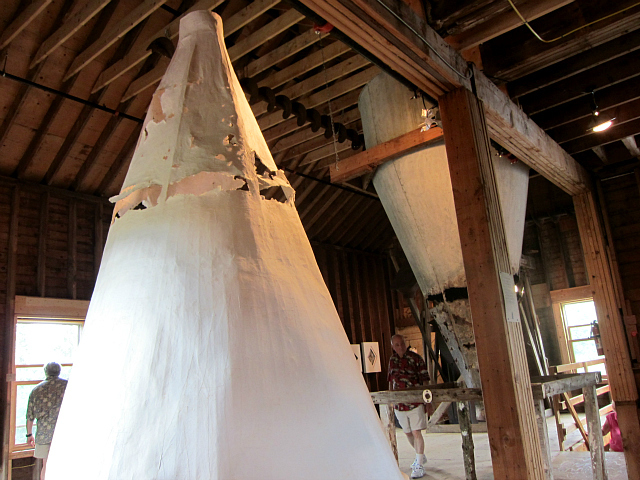 Inside the former Maxon Mills, built in 1956 for storage and the processing of animal feed, the first artwork was a contrast with the slow, rural feel of the place. 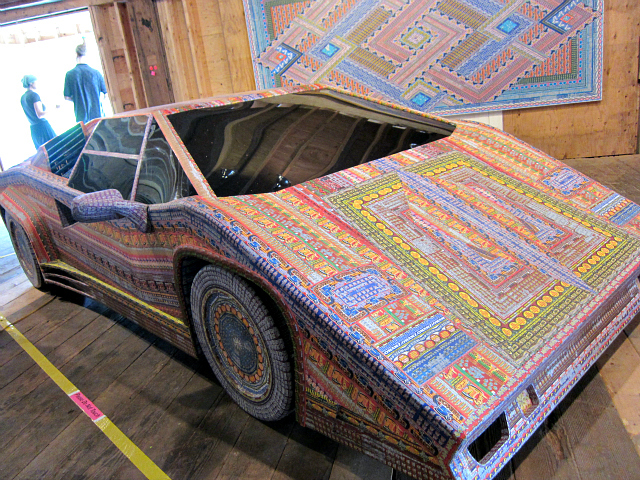 Ghost of a Dream, a duo composed of Lauren Was and Adam Eckstrom, creates elaborate art from used lottery tickets, including on a full-size wood and plastic Lamborghini entitled “Dream Ride 5, 6, 7” (2010), which was exhibited at Wassaic. The couple lives right by the Wassaic Project, but started their collaborations in New York City, and despite their move to the country their art still comments on a very city-driven materialism, developed from the losing lottery tickets they used to find on the streets. I spoke with Lauren Was while at Wassaic, and she said that the car was made while they were in China for an exhibit with Galerie Paris-Beijing. China is the second largest buyer of Lamborghinis after the United States, and the car is plastered with lottery tickets, half American and half Chinese, reflecting thousands of dashed dreams. Ghost of a Dream also has two-dimensional pieces on the walls, including “Forever, Almost,” a large blue work patterned after prayer rugs, composed entirely of one man’s collection of failed lottery tickets from a lifetime of trying to get rich to build his dream home. Ghost of a Dream is part of the Return to Rattlesnake Mountain exhibit, the 2012 edition of the annual summer show that includes more than 100 artists, over 50 of whom are alumni of the Wassaic’s Artist Residency Program. The title refers to the Rattlesnake Mountain that rises gently beside the Wassaic Project, and the exhibit winds up through all seven floors of the mill. Several of the standout works have a relationship to the industrial feel of the place and its rural surroundings, like “Ghost” by RISD instructor Kelly Goff, that has a phantom of an old machine built from paper installed beside the original, but upside down. 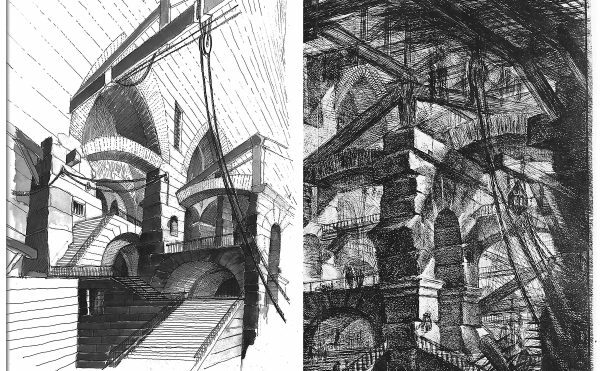 It reminded me of artist Mark Dion’s white ghost-like objects recently shown at the Explorers Club on Manhattan’s Upper East Side, which appeared to subvert the ambitions of 19th century exploration, except here the fragile duplication and its inversion comments on the collapse of the factory and its economic force. Beacon, New York-based Mollie McKinley’s “Huck Finn Raft Altar” also responds to the area, although going for its rustic nature over industrial, creating a multimedia installation from a dock she salvaged from the shore of the Hudson, not unlike the raft found by Huck Finn in Mark Twain’s novel washed to the banks of the Mississippi. Visitors are asked to join either a friend or stranger in sitting under the tent and listening to the waves, bird calls and other noises recorded by McKinley from the Hudson. 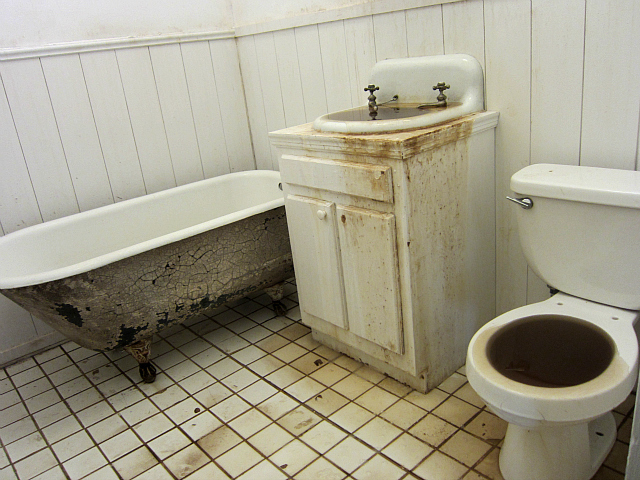 Across from the contemplative piece from McKinley are more water noises, but on stepping up to the doorway of the installation the scene is much more repulsive: an overflowing, fetid bathroom, an endless cycling “Fountain for the Pariah” which Brooklyn artist Louie Hinnen created while in residence at Wassaic. Other objects were labeled as a gold filling from Mock’s mother’s and one of Mock’s baby teeth. 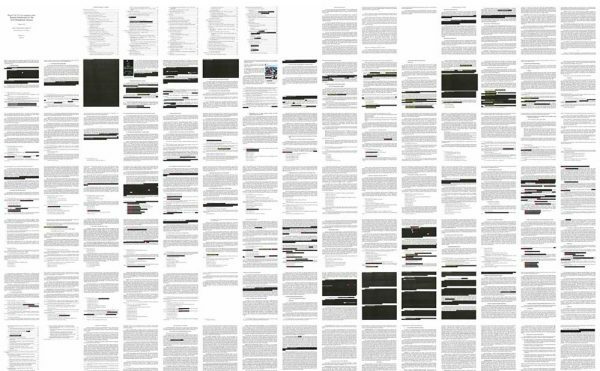 I started to wonder if all the objects were what they said they were, and was reminded a bit of P.T. Barnum’s American Museum, where outrageous creatures like dead mermaids were displayed alongside living people like siamese twins and bearded ladies, blurring the lines of reality as you accepted as a whole this presentation of oddities. 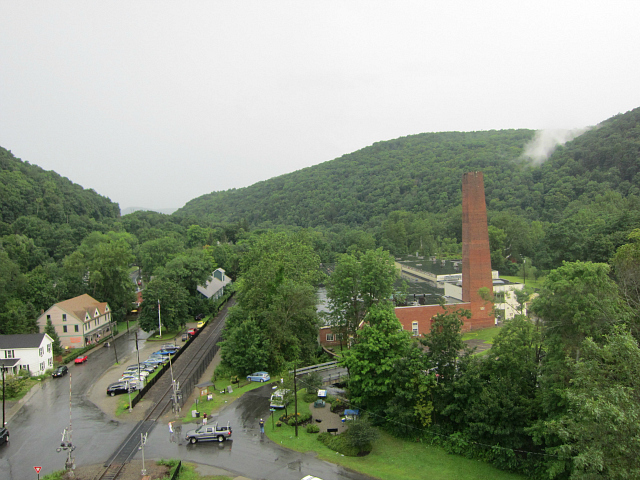 The seventh floor has a vertigo-inducing view out to Wassaic where rain was shining the roads. 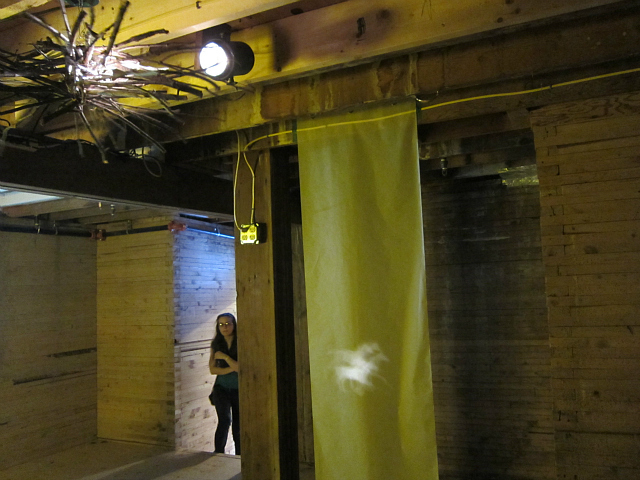 The top floor has been given over to a single artist for the summer exhibits, and Mock’s is the first to leave the windows entirely open and not totally transform the space (last year, Jeila Gueramian and Scott Anderson had an installation that consumed the room with a fabric landscape of monsters and trees). 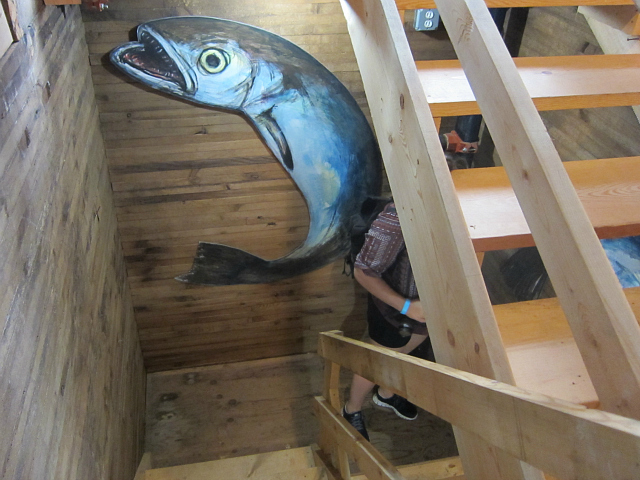 Taking the stairway back down held some playful surprises, like bounding fish by Alexander Bevington, an artist who works in both New York and France and has a series of large-scale cutouts of animals, food and household objects. 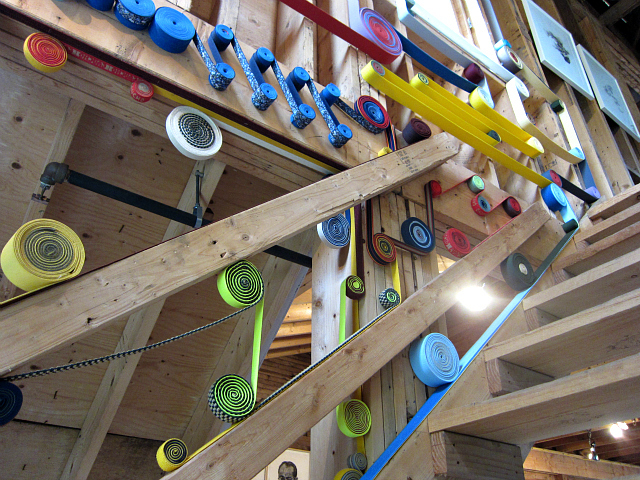 There was also this installation on another stairwell of colored belts by Brooklyn-based artist, and former Wassaic Artist-in-Residence, Ian Trask, that gave the wooden staircase some frenetic movement and wound all the way up to the ceiling. My favorite work was “Stampede,” an installation by Brooklyn-based artist Lindsay Packer, which used a simple idea to haunting effect. 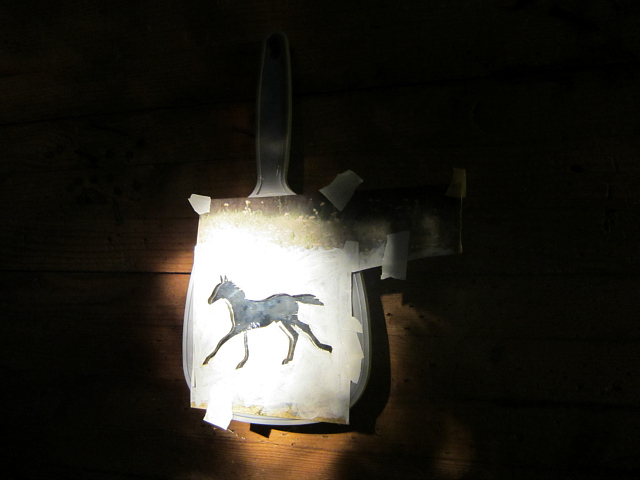 A light shone through a rotating bundle of twigs to a mirror with a cut-out of a horse, which reflected shadows of stallions onto a hanging sheet where they shuddered in a tight herd, shaking like a cave painting seen by candlelight. 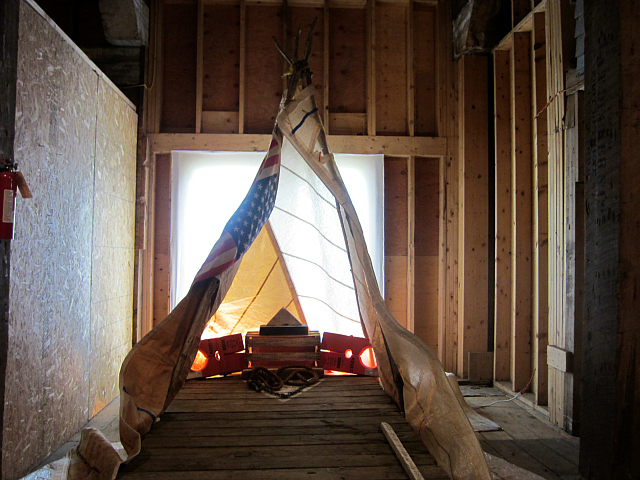 Packer was a winter resident at Wassaic, and roamed through the building while it was empty of art, creating “Stampede” in the solitary dark and cold of this room. Cracks of thunder and then sheets of rain rolled into Wassaic later in the afternoon, forcing the festival goers to take shelter in the mill or under a tent on the deck. By then the music had wrapped up and most of the campers had moved back to Brooklyn or wherever they had wandered from. 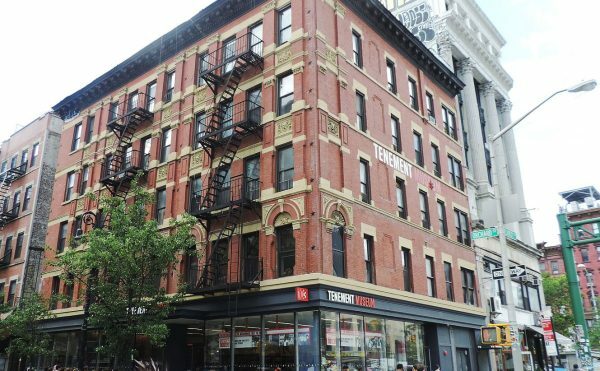 Although there was definitely a large gathering of New York City day- and weekend-trippers, there were just as many people from the area who had driven in for the festival. The Wassaic Project excels at presenting contemporary art in an inviting setting, and by collaborating with the community to bolster in its regional image they are reimagining this once derelict old mill as a regional center for arts. As they continue to expand the festival and residency program, and work on new initiatives like a partnership with a bar across the street and off-season music programs, it is likely the Wassaic Project will continue to cement itself as both a retreat for urban artists and resource for the local community. 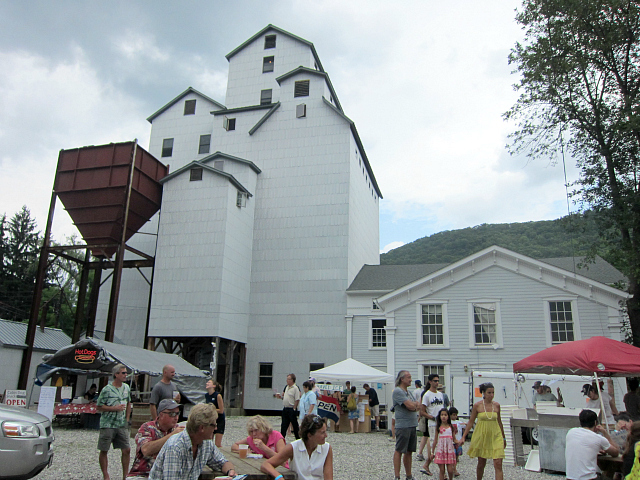 The Wassaic Project Summer Festival was August 3 to 5. Return to Rattlesnake Mountain shows through September 2, 2012 at the Wassaic Project (19 Furnace Bank Road, Wassaic, New York).